Award-winning author and illustrator, Donovan Bixley, is currently chronicling the heroic adventures of the famous CATs pilot, Claude D’Bonair. Donovan very kindly put me in touch with Claude, who took some time out from fighting the dastardly DOGZ to answer my questions. We’ve heard the tales of your daring missions so far. What are the three most important things to take with you on a mission? Phew Zac, you had to start with a hard question. Let me think … well, the truth is that we never know where the next mission will take us, or what danger we’ll be heading in to. You can’t rely on anything. You might find yourself deep in enemy territory without your squadron. You might even lose your plane … which happens to me more often than I’d like to admit! Quick thinking and fearlessness has helped me get out all sorts of dangerous situations. So, I guess the best thing I can take on a mission is my courage and inventiveness … that, and a packet of cat biscuits. How do you prepare before going off on a mission? You’re asking the wrong cat. I’m not much for preparing. I just try and figure out what to do as I go along. My friend, Syd – he’s actually more like an uncle to me – he likes to “prepare” for a mission by eating and sleeping. Syd says, “In war, you never know when you’ll get you’re next meal”… that doesn’t explain why he used to eat and sleep all the time before the war too! For me, a change is as good as a rest. I like to clear my mind, practicing Meowzaki, the martial art I learnt from my dad. C-for is the cat responsible for the brilliant inventions that help you on your missions. What is your favourite of C-for’s inventions? It would have to be his exploding fake dog poop. You get in to some pretty hairy situations on your missions. Who is the best cat to have by your side when catastrophe strikes? When catastrophe strikes, it usually means you’ve downed your plane behind enemy lines. In those situations you want someone who doesn’t just follow orders. You want someone who speaks their mind and thinks on their feet. I think I’d want to have Manx at my side when I’m in a tight jam. Manx and I just got back from a dangerous mission in Venice and really she saved my tail that time. Manx is a top engineer and real problem solver in tricky situations. Your dad was a race car driver, adventurer and pilot and you certainly seem to have inherited his bravery. What was one of the most important lessons that you learnt from him? Ha ha, that makes me think of a time when I was young, when dad and Syd took me on one of their crazy adventures to Japan. Syd is always suspicious of new things – but this one time, he thought wasabi paste was a lip cream – ha ha – after that, he wouldn’t eat Japanese food for the rest of the trip. My dad was completely different. He was never afraid to try new experiences. It can be scary at first, especially when you’re in a new place and you don’t speak their language, but you soon find that they are just like you. Whether someone was cat or dog, ginger striped, or black and white spotted, my dad always treated others they way he wanted to be treated. So I guess he left me with two great lessons: to be fair and to be fearless. I owe my life to those lessons, and even though CATs are at war with the DOGZ army, I’ve often made friends with dogs who’ve helped me when I’ve been in greatest need. What do you like to do when you’re not off foiling the DOGZ plans? You know, I’m not one of those cats who like to lounge around sleeping all day (unlike some cats I could name). I love to get out and see the world and try new things. One day, when cats and dogs are living in peace again, I want to take off and see some of the friends I’ve made around the world. That will make for some exciting adventures. Alan Brough is the author of the crazy, laugh-out-loud new book, Charlie and the War Against the Grannies. Alan is a Kiwi who now lives in Australia and he has worked as an actor, director, musician and a dancer before he became a writer. Charlie and the War Against the Grannies is his first book for children and I certainly hope he writes many more. I had a few questions I wanted to ask Alan and he has very kindly answered them for me. Read on to find out about weird granny behaviour, the things you need to have in a war against grannies and how Alan came to write his crazy story. What inspired you to write Charlie and the War Against the Grannies? One morning I was watched a middle-aged man in a beaten up old car deliver my newspaper and I wondered whether kids did paper round anymore. That afternoon I saw a granny delivering pizza menus and, for some reason, I came up with the idea that a boy tries to get a paper round but can’t because all the deliveries in his neighbourhood are controlled by an evil cabal of violent grannies. What is your strangest grannie experience? My grandmother had a glass eye. The idea of it completely freaked me out. One morning at the breakfast table she took her glass eye out and rolled it across the table to me to try and make me feel more comfortable about it. It didn’t work. Did you have a paper round when you were a kid? No. I couldn’t cope with the early mornings. What are the 3 most important things you need to fight a war against grannies? Shortbread laced with tranquillisers, a hairnet full of false teeth and questionable morals. Charlie and Hils have an awesome secret code called Flush Latin for communicating secretly from a toilet when they get in trouble. Did you have your own secret code when you were a kid? You’ve been an actor and a director as well as an author. How different is comedy on the page than comedy on the screen? I suppose the essential difference is that comedy on the screen can be done purely with images. You can tell a whole joke without words. Whereas comedy on the page – for me at least – is all about words. Their order, the way they sound and even the way they look. Charlie is hilarious and I’m sure it is going to have kids rolling around on the floor in fits of laughter. Who are your comedy idols when it comes to writing? Mark Smith is the author of the amazing new YA book, The Road to Winter. I absolutely loved The Road to Winter, from the first page to the last! It’s a thrilling story of survival in the aftermath of a virus that wipes out the population. Check out my review here. I was thrilled to have the chance to interview Mark about The Road to Winter. Read on to find out what he couldn’t live without, what inspired him to write The Road to Winter and what books you should read next if you like his book. What inspired you to write The Road to Winter? The Road To Winter (TRTW) evolved from a short story I wrote in 2013, entitled Breathing In and Out. When I decided to turn it into a novel I was determined to write a page turner that would engage younger and older readers alike. It is largely an adventure story told through the eyes of a sixteen year old boy – but it touches on a number of very relevant issues, including conflict, attitudes to violence, relationships, loyalty and the treatment of asylum seekers. The Road to Winter is set in the aftermath of a virus that wipes out a significant part of the population. Would you survive if you were in Finn’s position? I’d like to think I would! The advice when writing is to “write what you know” and Finn’s understanding of the environment – and how to survive in it – is largely my own. He hunts, fishes, grows veggies and trades food. I think the hardest test Finn faces is the isolation – which, of course, is broken when Rose arrives in town in need of his help. What is one thing that you absolutely couldn’t live without? Coffee! I actually thought of weaving that idea into the story somewhere but it didn’t make the cut. When you are creating a dystopia there are lots of these decisions you need to make – what’s still there and what’s not. In TRTW though, I deliberately didn’t take a lot of time to explain the dystopia because I wanted it to be a character driven novel, rather than one dealing just with the consequences of living in a post-apocalyptic world. Finn has his dog Rowdy but who would you want by your side if you were in Finn’s situation? Finn feels the loss of his family very deeply and I certainly would too. If I were forced to survive in a world like his, I’d want my family there with me to help! What is your favourite survival story and why? As an outdoor education teacher I’m a huge fan of adventure non-fiction. I consume books about survival in extreme circumstances – Jon Krakauer’s Into Thin Air and Joe Simpson’s Touching The Void. Simpson’s story is an incredible tales of survival. I’d also recommend the account of Ernest Shackleton’s epic journey of survival in Antarctica in 1914 and Tim Cope’s On The Trail of Genghis Khan. The Road to Winter is your first book. How was your road to publication? By 2014 I’d had more than twenty short stories published in magazines, journals, anthologies and newspapers in Australia. I learned my craft as a short story writer but I always wanted to write a novel. It took me 18 months to get the manuscript of TRTW ready to submit to a publisher. I chose Text because they have a strong reputation for supporting new writers. They loved the manuscript and offered me a three book deal. The sequel to TRTW is due for release in May 2017. I know the road to publication is a long and difficult one for most writers and I am incredibly thankful that mine was relatively smooth – but, in the end, it’s the quality of the writing that will decide whether your work is published or not. The Road to Winter is marketed as YA but it has the look of a gritty adult thriller. Did you write it for a particular audience or just because you wanted to tell this story? It’s a really good question! I didn’t consciously write a YA novel – I wanted to tell a particular story in a particular way – through the eyes of a sixteen year old boy. I do think that we often categorise books by their protagonist rather than by what the story is saying and whom it may appeal to. I think TRTW will crossover into the adult reading market very easily – and Text have printed it in trade paperback format to encourage that. As you say too, it has the look of a gritty adult book – again, the cover design being part of the crossover appeal. What other books would you recommend for fans of The Road to Winter? In writing TRTW I was influenced by reading a number of books – some obvious, some less so. The obvious ones are John Marsden’s Tomorrow series and The Ellie Chronicles. But I also enjoyed The Dog Stars (US) by Peter Heller, Clade by James Bradley and Jasper Jones by Craig Silvey. Beetle Boy by M.G. Leonard is one of my favourite books so far this year. I got the chance to interview M.G. Leonard for Christchurch City Libraries. You can read my review of Beetle Boy here on the blog and follow the link to check out the interview. Em Bailey is an award-winning Australian author. Her previous book, Shift was the winner of the 2012 Gold Inky Award for best Australian YA novel and was selected as a notable book by the Children’s Book Council of Australia. Em’s new YA novel, The Special Ones is an incredibly exciting, twisty, nail-biting read. You can read my review of The Special Ones here on the blog. The Special Ones is one of those books that I can’t get out of my head. I had a few questions that I was dying to ask Em and she has very kindly answered them for me. Read on to find out her inspiration for the book, what it was like to go inside the head of a psychopath and what draws her to writing for teens. What inspired you to write The Special Ones? I’ve always been interested in the psychology of cults: what sort of person becomes a cult leader, the people who are drawn to them, what happens when someone attempts to leave. I knew I wanted to write something about this theme and I started thinking about how modern technology might affect the way a traditional commune-style cult operated. I began imagining a situation where someone was able to control and manipulate a group, in the way that cult leaders traditionally always have, but without needing to be physically present. Which of The Special Ones are you most like? ‘Him’? No, not really! I don’t think I’m very much like any of the girls, although I guess certain aspects of Esther’s personality are like mine but she is much tougher and far more determined than I am. I like to write about characters who make mistakes and do dumb things – sometimes even really bad things – because I think it’s still completely possible to have empathy for them. A number of people have told me that they really dislike Lucille in The Special Ones, but I must admit to having a soft spot for her. She’s put through a very traumatic series of events after all, and a lot of her complaints about Esther seem justified to me. Is the cottage in the book based on an actual place? The farmhouse isn’t based on a particular building, it’s more a composite of many. I started planning The Special Ones while driving through South Australia with my family. I spent a lot of time looking out the window at the dry landscape and noticing the abandoned, ramshackle old stone farmhouses here and there. It’s that kind of environment that I picture for The Special Ones and I imagined the girls being imprisoned in one of those solid old buildings. You take readers inside the head of a psychopath in The Special Ones. Did you have to prepare yourself to get into character when writing these parts? It was difficult, and exhausting, to be in ‘his’ head. I would be working on a passage and realise that I was writing it from a normal person’s perspective, with typical, human reactions to things. I would then have to stop myself and think ‘but how would a psychopath view this situation?’ I read Jon Ronson’s book The Psychopath Test book as part of my research and I had a list of psychopathic characteristics stuck up beside my desk which I used to refer to as a way of keeping myself on track. It wasn’t very pleasant. I would often find myself frowning or clenching my teeth as I was writing from his viewpoint. It was always such a relief to flip back into ‘Esther-mode’. Apart from ‘him’ in your story who is the most evil, twisted character from a book or movie that you’ve come across? I am a bit of a wimp when it comes to scary books and movies (yes, it’s ironic I know) so I’m probably not the best person to answer this. I did however read a lot of non-fiction accounts of cults while preparing for this book and it was amazing to notice the similarity between the various cult leaders. They share such an unswerving belief in their own greatness and a complete disregard for the rights of anyone else. Because they lack the ability to feel empathy the suffering they inflict on others has no effect on them whatsoever. It’s chilling to read about people like this because it’s clear they genuinely don’t realise they’re doing anything wrong. How did the story come together? Did you know how it was going to end? Nutting out the plot was a very long process. I knew basically how I wanted to resolve things, but it took a lot of work to get the details right. I think I re-wrote the entire second half at least four times. It was painful at the time, but ultimately it was necessary for getting the storyline to follow a course that felt right to me. What do you love most about writing for teens? Writing for teens is great because there’s so much scope. The YA genre is so broad now that you can really go in any direction you want and explore a wide variety of themes. I’m drawn to writing plot-dense stories and this works well with teen literature. I think of my books as being escapist but hopefully also reasonably substantial, theme-wise. Teens read a lot more widely and with a greater level of sophistication than they did in my day, so there is also the challenge of writing something which will meet with their approval. Christopher Edge is the author of many great books for kids, including the Penelope Tredwell books Twelve Minutes to Midnight, Shadows of the Silver Screen and The Black Crow Conspiracy. Christopher’s latest book is the out-of-this-world, inter-dimensional adventure The Many Worlds of Albie Bright. I absolutely love this book and you can read my review here on the blog. I had some questions about The Many Worlds of Albie Bright that I wanted to ask Christopher and he has very kindly answered them for me. Read on to find out if bananas are indeed radioactive, which Back to the Future film is Christopher’s favourite, and what’s the coolest thing that he has ever built. What inspired you to write The Many Worlds of Albie Bright? Lots of things! One of the sparks was a popular science book I read called How To Destroy The Universe And 34 Other Really Interesting Uses of Physics. It described cancer as a ‘quantum killer’ and explained how this disease is caused by a single-cell in your body mutating and going rogue. This got me thinking about the Many Worlds Interpretation of quantum physics which suggests that quantum events might happen in one universe but not a parallel universe, so I had the idea of a boy who might have lost his mother to cancer and how he might try to use quantum physics to find the parallel universe where she is still alive. From this spark I slowly built the story and thought about the different parallel worlds the boy might find and how his life might be subtly different in each one. When friends asked what I was writing, I told them it was like It’s A Wonderful Life, but with added quantum physics! One of the things I love about your book is that there is lots of science in it. Did you have to do lots of research? Back when I was at school, I got a grade D for GCSE Physics – so I’m not any kind of science whiz! But as an adult I’ve become fascinated by the wonders of the universe as expertly explained by scientists such as Brian Cox, Jim Al-Khalili, Michio Kaku and Brian Greene. The American physicist Richard Feynman once said, “If you think you understand quantum physics, you don’t understand quantum physics”, but thanks to a huge pile of books in my office by these and other expert authors, I’ve been able to pretend that I understand a little more than I did before I started writing The Many Worlds of Albie Bright. It was important to me that all the science mentioned in the book was real and accurately described, so I had the manuscript checked by a friend who’s a Professor of Particle Physics and also works at the Large Hadron Collider at CERN. Luckily he said it passed the test! Amazingly, YES! All bananas contain potassium which is a natural source of radioactivity. This means that if you’re standing next to the fruit bowl in your kitchen and it’s got a banana in it, then every second you’ve got a chance of being blasted with a gamma ray of radioactivity. Don’t worry this is completely safe and won’t turn you into a radioactive banana-eating superhero! However, large shipments of bananas have been known to trigger false alarms when they pass through radiation monitors at ports and airports! Albie uses just a computer, a Geiger counter, a cardboard box and a banana to travel between dimensions. What is the coolest thing you’ve ever built? A Tusken Raider from Star Wars using toilet rolls and cardboard boxes! Back to the Future gets a couple of mentions in your book. It’s obviously a favourite of yours (who can blame you?). Which movie is your favourite? If you could travel to a different dimension what is one difference that you would like to see and one that you wouldn’t like to see? Difference that I’d like to see: greater equality. Difference that I wouldn’t like to see: a universe where libraries no longer exist. #savelibraries! What’s the thing you enjoy most about writing stories for young readers? It’s funny, I spoke about this at the end of an interview I gave to Front Row on BBC Radio 4 and said that one of the things I like best about writing stories for young readers is that you have a fearless audience. Young readers aren’t a jaded audience – they’re an audience with high expectations, who will go with you anywhere if you can deliver on giving them a great story. And it’s a real honour to write for an audience like that. To find out more about Christopher Edge and his books visit his website, www.christopheredge.co.uk. Today I’m very excited to be joined by Katrina Nannestad, author of the enchanting new book, Olive of Groves. You can read my review of Olive of Groves here on the blog. I absolutely love this book and I wanted to ask Katrina a few questions about her book, her characters, and what we can expect next from Olive and the gang at Mrs Groves Boarding School for Naughty Boys, Talking Animals and Circus Performers. Thanks for joining me Katrina! What inspired you to write Olive of Groves? ‘How about a boarding school story?’ A simple suggestion from my publisher and the world of Groves came tumbling, rumbling, rollicking into my mind. The way a story takes shape can be a little mysterious, but I do remember starting with my students – talking animals for charm, naughty boys for action and circus performers for a touch of the exotic. The combination of all three was sure to lead to adventure, danger, disaster and hilarity. Mrs Groves, kind but bonkers, bumbled forth as the perfect headmistress – one who would not interfere too much with the students’ wild and woolly activities. Once I started writing, the story seemed to take on a life of its own. I just went along for the ride, recording events as they happened, throwing in a pithy comment or two along the way when the need (or urge) arose! You have a delightful cast of characters in Olive of Groves. Do you have a favourite character? Such a difficult question! It’s a bit like asking a parent which child is their favourite. Olive, of course, is my beloved heroine of whom I am very fond and proud. What a sweety-pie! But I also adore Pig McKenzie, head boy and school bully. I have had an enormous amount of fun creating this Pig of Poor Character, developing his wicked schemes, fabricating his ridiculous tales of heroism. There is something thrilling about writing a truly despicable character, a villain who inspires us to boo and hiss and stamp our feet every time he sets his fat, pink trotter on the page. There is also something marvellous in knowing that his fate is in my hands! Which of your characters are you most like? I hope that I am most like Olive. I always write something of myself into my heroines. Like Olive, I am a little bit clumsy, I can read and write big words like ‘conflagration’ and ‘arthritis’, I like choc-chip bickies and I strive to be brave, kind and loyal. I fear, however, that I am more like Mrs Groves. I do bumble around the house muttering to myself, I am rather forgetful, I’d rather dive behind a potted palm or some heavy velvet curtains than confront troubling issues and I do cry, ‘Goodness gracious me!’ many times each day. Lucia Masciullo’s illustrations are wonderful. Are they just as you pictured your characters? When I write a story, I develop a vivid mental picture of my characters and their world. To have someone else step in and present their own interpretation of that world could be rather troubling. Lucia, however, is a genius! When the roughs for Olive arrived, I thought, ‘Of course! That is just what my heroine would look like!’ From that point on, Lucia’s Olive was the picture in my mind as I was writing. There is often a little bit of to-ing and fro-ing with roughs and the ideas around characters, but Lucia is incredibly perceptive and has embraced the craziness of Groves. Her illustrations have not changed the characters but have added to their personality and charm. I feel very privileged to be working with this wonderful artist. You have a word-loving rat in your story called Wordsworth and it’s clear that you love playing with words. Do you have a favourite word or words? I love words that roll off my tongue, like ‘haberdashery’ and ‘brandish’. I love words that are out-of-date and sound like something my granny might have said, like ‘evidently’ and ‘poppycock’. I love ridiculous words, like ‘bowels’ and ‘squelch’. I love words that contain an entire character description, like ‘prim’ and ‘unscrupulous’. And I adore words that conjure up big pictures, like ‘flamboyant’ and ‘pandemonium’. Chester the rat loves to collect buttons. Do you collect anything? I didn’t really set out to collect pigs, but I have quite a few hanging around. Perhaps people have seen a rusty metal pig in the garden and a wooden pig in the kitchen and they have thought, ‘Hey! I’d better buy Katrina a pig!’ … which is lovely … but also a little bit weird … As a result, I now have a large herd of pigs snuffling and snorting about the house. There is also at least one pig in every book I have written! Do you have any naughty boys, talking animals or circus performers in your life? I grew up in a neighbourhood stuffed full of naughty boys, all running around on the tail of my brother’s hare-brained schemes. There were rotten plum fights, parachute jumps, flying fox disasters, wrestling matches, slingshot wars, firecracker explosions, bike stunts … and that was just in our back yard! Now, I am the mother of two boys, so the naughtiness lives on. I am surrounded by talking animals! My dog, Olive, talks incessantly when we are out walking: ‘Look at that dog over there! Can we go and play with him? Can we? Huh? Can we?’ or ‘Oh no! There’s a bicycle headed our way! A bicycle! You know how they terrify me! Aaaaah!’ The birds in my garden are constantly arguing over branch rights – who got there first and who should take a hike – and whether or not it’s okay to use the birdbath as a toilet. And the nanny goat in the neighbour’s paddock shouts some very rude things to Olive every time we walk past. Sadly, there are no circus performers in my life. I am, however, currently building a cannon in the shed, from which I plan to fire my husband and then my two sons. I am expecting them to land somewhere on the South Island of New Zealand. Do you have more adventures planned for Olive? Absolutely! Books 2 and 3 are already written. This very morning, I received Lucia Masciullo’s cover illustration for the second Olive of Groves. It’s magical! We are currently editing the third Olive of Groves. Books 2 and 3 are due for release next year in May and November, respectively. 2016 will be a busy time for Olive and her friends! The Pig of Evil Intent returns, too, so BEWARE! Derek Landy is the author of the Skulduggery Pleasant series and the new Demon Road series. He is one of my absolute favourite authors and I have loved everything that he has read. I got the chance to meet him and interview him back in 2010 when he was part way through the Skulduggery Pleasant series (you can read the interview here). Since he has started a new series I wanted to ask him a few questions about it and get the scoop on Demon Road. Read my interview with Derek to find out how many Demon Road books we have to look forward to, what Derek’s favourite supernatural being is, and why Derek loves horror stories. How did it feel starting a new series after you had been living in Skulduggery’s world for so long? Scary, daunting, but also thrilling and refreshing. I was fully at home writing Skulduggery, and possibly too comfortable. That’s not always a good thing for a writer, so a new challenge was needed to stop things from getting stale. Why did you choose to set your new series in America? How many books are you planning on writing in the Demon Road series? Three. There was no way I was committing to a nine book series like I did with Skulduggery! What is your favourite supernatural being? There are some really gory scenes in Demon Road. Are these your favourite parts to write? Out of all of your characters which one are you most like? I’d like to think I’m like Skulduggery — cool, charming, and awesome. But the truth is I’m probably a mixture of Glen and, I dunno… Scapegrace. Do you see your two series crossing over? Will Skulduggery characters make an appearance on the Demon Road? That was a temptation that I ultimately decided against. I wanted people to be able to pick up Demon Road without needing to know the rules of magic as set down in Skulduggery. Plus my vampires in both series are completely different, and I didn’t want to confuse people. Why do you love horror stories? What other books would you recommend to kids and teens who love your books? These days I’m recommending ‘The Rest of Us Just Live Here’ by Patrick Ness to everyone, as well as the Shattered Sea trilogy by Joe Abercrombie. Loved them both. 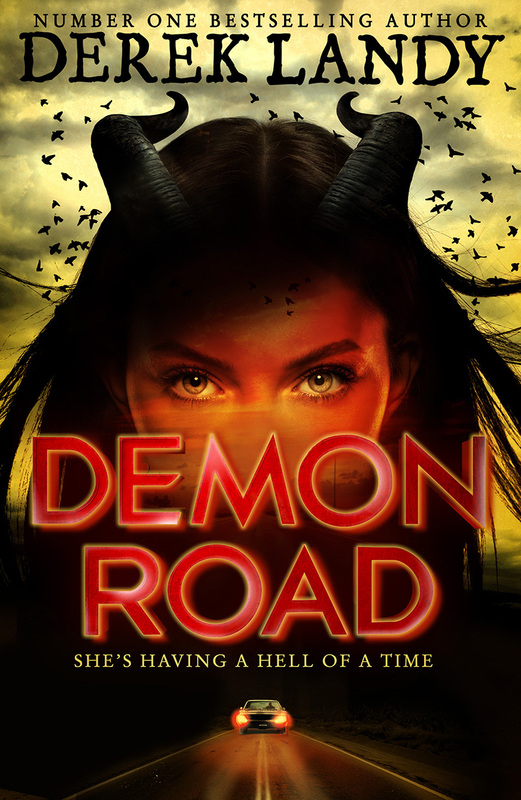 Demon Road by Derek Landy is out now. Go and grab a copy from your library or bookshop now.